Exit Through the Gift Shop | We Can't Hear the Mime! We Can't Hear the Mime! I love when a film that I always intended to watch gets bumped up my list by a particularly interesting conversation. It’s even better when the film turns out to be totally worth the watch. Most people I’d heard talk about this film made it seem like some kind of documentary-thriller where Banksy magically turns the tables on a filmmaker and comes out as even cooler than anyone thought he was when he went in. I guess that’s the cult of Banksy speaking, because this film really seems to, if anything make Banksy out as a bit of a fool. There has of course, given the anonymity of Banksy and the strangeness of the story, been a lot of debate as to whether the whole film is another elaborate hoax. Whether the protagonist is actually Banksy all along or whether any of this actually happened. The arguments for none of it ever happening seem meagre, after all someone was genuinely filming street artists for over ten years. I’m not sure it entirely matters who was filming and I intend to review the film as it presents itself, as truth. The film follows Thierry Guetta, an enigmatic French second hand clothes seller turned videographer. I don’t say filmmaker because his filming is a habit, a compulsion to record, more than any instinct to create. This man happens to be the cousin of Space Invader, the Parisian street artist and so in his obsessive quest to record and document his own life he winds up filming street art, meeting new street artists and still filming. Eventually he becomes their accomplice and is recording reactions to pieces that the artist themselves would never see. Here the film, being directed by Banksy, takes a turn for the hero-worshipping. The voiceover and editing seem very keen to insist that Guetta was on a hunt for Banksy in order to film him too. Guetta himself is without a doubt interested but seems so wrapped up in his own quest for validation and a continued permission to keep filming that he could have continued for years non-plussed had Banksy not just walked into his life and lens. Guetta is, as Banksy states, far more interesting as a subject than any plain documentary on street art. He spent years lying to numerous high-profile street artists about a non-existent documentary he was making just to continue filming. The shots of tapes in his house show the terrifying consequences of his obsession. Boxes and boxes of tape, most of it unlabelled, containing years of his life and key moments in the history of an art movement potentially never to be found again. When Banksy takes over these archives he patronisingly tells Guetta to try some art himself. So here are our two protagonists, the hooded man who is our director and the cameraman turned subject. Guetta takes Banksy’s advice as an order and sets off to become a street artist in his own right. His approach is to take everything he had seen his friends do but to do it bigger and better. His work is at best derivative but through manipulation and clever marketing his Warhol meets Banksy ripoffs become a huge success. Many criticise him for not making the works himself, for having the idea and handing it over to his team of employees, yet earlier we saw Banksy’s crew deconstructing a phone box and no one is throwing the same criticisms at him. Indeed, this system only serves as an argument for the place of Mister Brainwash (Guetta’s adopted street art name) within the art world. After all, Rubens didn’t paint everything himself. He sketched a structure then retouched and signed the painting his apprentices made. Was he any less of an artist? 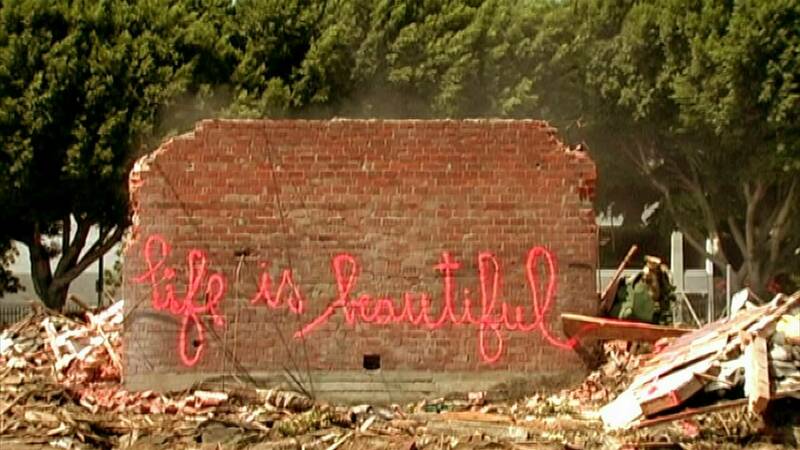 The film Banksy produces, the film we are watching is undoubtedly the street art documentary Banksy always dreamed of. Of course, he is as a result the star and most interesting street artist that has ever lived: things must always be taken with a small pinch of salt. Strangely, many of the criticisms levelled at Mister Brainwash can equally be levelled at Banksy. He complains that MBW (Mister Brainwash) never had to find his feet as an artist, never had the years of hard graft, but where is his hard graft as a filmmaker? He’s taken ten years of someone else’s footage, slapped his own very marketable name on it and sold it to the masses. Besides, does it matter how long it takes to “find a voice”, or is that just Banksy the snob speaking, hoping that no one realises that he’s as big a scam as MBW? In the end if this buffoon of a man can become a world famous street artist overnight how can Banksy rebuff the “anyone can do that” criticisms? This isn’t just a documentary about street art. It’s about all art, the right to create, the boundaries placed on creativity by “intellectual property”. It’s a film about artists, how we’ll never really know if they were really inspired or mad or who was ever pulling the strings. That’s for them to know or not know in their thefts and manipulations, all we can do is consume what they give us and exit through the gift shop. This entry was posted in Film Reviews, Personal Screen and tagged Banksy, Documentary, Exit Through the Gift Shop, Faites le Mur, Film Review, MBW, Mister Brainwash, Space Invader, Street Art on January 22, 2015 by Flo. We Can’t Hear the Mime on Twitter!